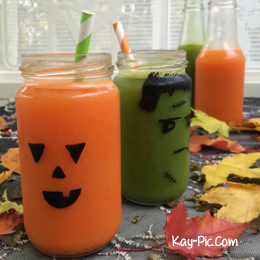 This page has some fun and gentle toddler Halloween crafts ideas that don't cost the earth and are really straightforward to do with any young child. Older children will enjoy them as well, and you can be a bit more adventurous the more independent your little crafter is! The emphasis on non-threatening creations - it's sometimes hard for us to understand how scary witches and ghosts can be to a 2-year-old. 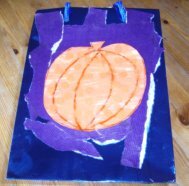 I made with my toddler a Halloween trick or treat bag and decorated it with a pumpkin collage on 1 side, and a leaf design on the reverse. Start by painting some paper with orange paint. Your toddler will love this, but it could be messy! You may wish to prepare this bit yourself if it suits you better. Now wait for the paint to dry. I found that drying time was not really suitable. As they were already messy, and I didn't want to do a clear up, then start again. So my TIP was to use the hair dryer on the paint. It added a bit of excitement, as they got to hold the paper down, and kept them interested to finish the job. TIP: When I did this, the paint wasn't dark enough so I did a 2nd layer. It was much better, but I needed to wait til the following day for it to dry. 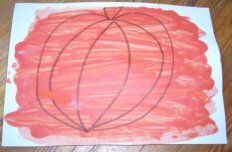 When the paint is completely dry, draw a pumpkin shape onto the paper with a thick marker. You really don't need any artistic ability to do this - I don't!! Start by drawing the outer shape, then work inwards with the curved lines. Practise on rough paper first, and you'll see how doable it is. Cut out your pumpkin shape. 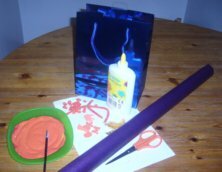 Now for the fun bit - stick Halloween confetti (or any decorations you like) onto the pumpkin. NOTE: You will probably need to brush a layer of PVA glue over any small decorations later to seal them and make sure no stray bits fall off. Collect some leaves, like these ones. You can make this part of the activity, as your toddler will love to be a big girl/boy and join in with the scavenge hunt. Now paint the leaves with your toddler. No need to use paintbrushes necessarily - see what effect finger painting creates. Also don't get hung up on having 100% coverage - you can see that not all these leaves are completely covered. 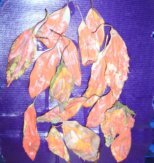 It's more about having fun with your little one than some boring uniform painted leaf collage. 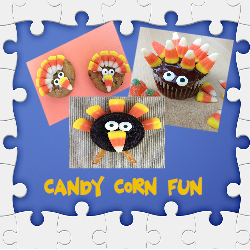 As Candy Corn isn't the best sweet for toddler teeth, using them as art is far better. Should a few end up being eaten, then let your young child know that it is toothbrush time.